Join Our Team! Become a Deputy Sheriff Today. 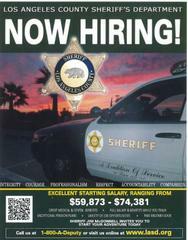 The Los Angeles County Sheriff's Department is Now Hiring. The Los Angeles County Sheriff's Department is now hiring for the position of Deputy Sheriff Trainee. Come to one of our Recruitment Fairs to see what the Department is all about. The Recruitment Fair is an opportunity for those seeking a Deputy Sheriff Trainee position to meet and greet with various deputy personnel who work at different assignments within the Department. The Recruitment Fair will feature the diversity in assignments of a deputy sheriff. Recruiters, Background Investigators, Special Enforcement Team (SWAT), and Special Victims Unit are a few of the units that you may meet with. * U.S. High School Diploma or G.E.D. All Recruitment Expo's will include walk-in testing for the position of Deputy Sheriff Trainee. Testing will take place at 11:00am and no appointment is necessary.